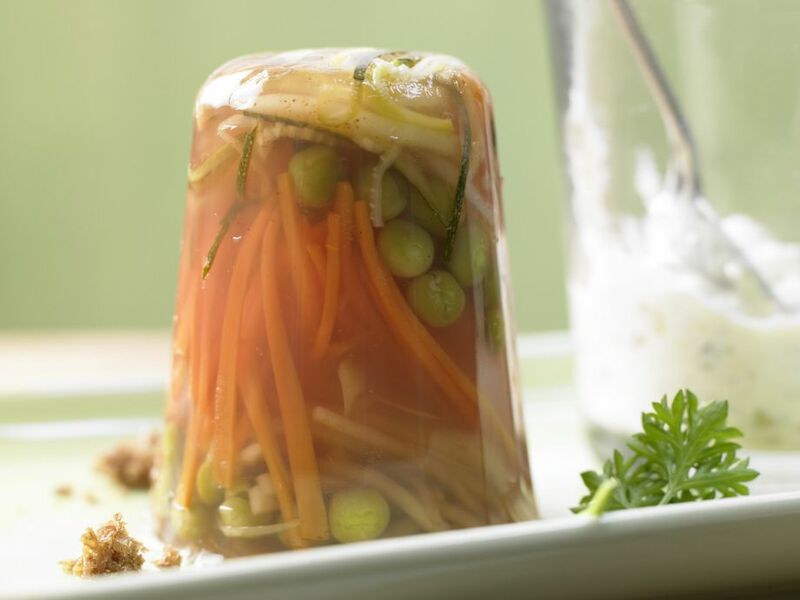 Baby Vegetable Aspic - Super simple to make: Sun-dried tomatoes, fennel and zucchini make this Mediterranean dish a winner! 1 Rinse basil, pat dry and pluck leaves. Combine basil leaves, sun-dried tomatoes, fennel seed and vegetable stock in a pot. Bring to a boil and allow to steep for 15 minutes. Pour through a sieve and let cool. 2 Peel carrots and celery root and cut into very thin strips. Trim and rinse leeks. Cut white and light green parts into very fine strips. Rinse zucchini and pat dry. Cut into very fine strips. Add vegetables to salted boiling water; adding carrot first, then celery root, leeks and zucchini strips. Cook until al dente. Drain well. Cook peas in salted water for 1 minute and drain. Transfer vegetables onto a kitchen towel to dry. 3 Distribute vegetable mixture amongst 4 250 ml (approximately 8-ounce) jars. 4 Add agar to 5 tablespoons of the prepared stock, mixing until smooth. 5 Combine remaining stock with vinegar over low heat. Stir in dissolved agar and bring to a boil while continuously stirring. Continue to cook for 2 minutes, stirring occasionally. Season with salt and sugar to taste. 6 Pour hot liquid into the jars and allow to cool. Chill for 6 hours. 7 Pierce eggs and boil until hard cooked, about 8 minutes. Rinse in cold water, peel and chop coarsely. 8 Finely dice the pickles. Chop capers. Trim scallions, rinse and slice into thin rings. Rinse the parsley and shake dry. Chop leaves finely. 9 Combine eggs, pickles, capers, scallions and parsley with sour cream and yogurt salad cream to make a remoulade. Season with salt and pepper. 10 To serve, invert the jars onto a large platter and unmold. Serve with remoulade and toasted whole-grain bread or potatoes.